In this one file, everything that you need to write your NANO novel can be collected ahead of 1 November. You won’t write a single word of your manuscript until NANO officially starts, but you’ll have everything at your fingertips when the whistle blows at midnight on 31 October. Select File / New to open the Project Templates dialogue box. Then select Fiction (to see the image below). Click on Novel, and then click on Choose. If you’re like me, addicted to NANO, include 2016 in the title. In years to come, whenever you open this project file and edit, you might find this a useful reminder as to how long a novel really takes to complete! 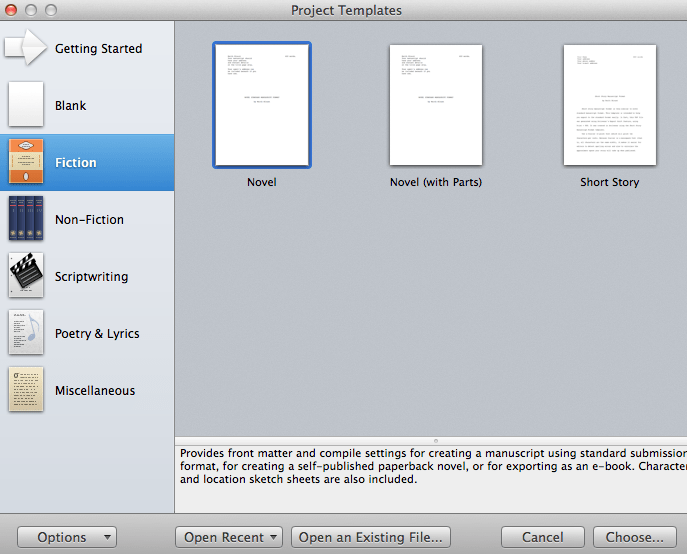 Scrivener then creates the project file. The initial screen opens with the text explaining how to use the Novel Format. Most of the effort in the next few weeks will be within the Research folder. The first task is to set up a new folder called MY STORY. Right-click on the Research folder and select Add / New Folder. Call this new folder MY STORY. Right-click on the MY STORY folder and add five text documents. You could do this by right-clicking and choose Add / New Text, but you could also use the + icon in the menu. I use these five documents to house descriptions of my novel – in various lengths and depths/complexity. The content will most probably change in time, but whatever I write here will prove useful when, having written this novel, I want to market the book. If you want to see me go through this process, or need to ask questions, book a place at the Simply Scrivener Special on Monday 19 September. To help me prepare, you could also complete this questionnaire.